The Miami Trace Lady Panthers golf team hosted Hillsboro for an FAC (Frontier Athletic Conference) match Wednesday, Aug. 24 at The Greens. Hillsboro won the match with a 209 to 270 for Miami Trace. Kristin Jamieson of Hillsboro had an even par score of 36 with one birdie on hole No. 1 and one bogey on hole No. 4. Miami Trace’s low score was 63 turned in by Maddi Wallace. Also for Miami Trace, Tanner Bryant shot a 65, Shelbie Rowan, 66; Bridget Perkins, 76; Taylor Perkins, 76 and McKenzee Dunn, 78. Other scores for Hillsboro: Emily Loudin, 50; Larkyn Parry, 61; Mallory Parsons, 62; Madi Stratton, 63 and Abby Myers, 65. Miami Trace’s next match is Wednesday against McClain at Buckeye Hills. Maddi Wallace tees off for Miami Trace during a Frontier Athletic Conference match against Hillsboro Wednesday, Aug. 23, 2017 at The Greens. Wallace had the low score in the match for the Lady Panthers. 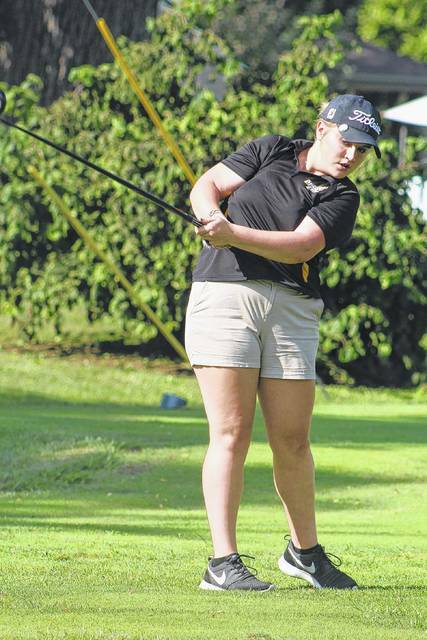 https://www.recordherald.com/wp-content/uploads/sites/27/2017/08/web1_Maddi-Wallace-MT-girls-golf-8-23-2017.jpgMaddi Wallace tees off for Miami Trace during a Frontier Athletic Conference match against Hillsboro Wednesday, Aug. 23, 2017 at The Greens. Wallace had the low score in the match for the Lady Panthers.